Removable rowing brace–note the rower’s seat is a Yeti, which when fixed to the rear bench seat becomes a poling platform. First things first: the Towee Rivermaster SRO is not a “driftboat”—at least not in the conventional way we fly anglers use the word. Nor does it resemble what we’ve come to call “skiffs.” Rather, the Rivermaster is a hybrid technical fish boat with a whole lot of applications. And just to be clear: when I say “hybrid”, I really mean “hybrid”. This boat borrows elements from conventional driftboats and skiffs, melds them with canoe and johnboat designs, and throws in a little tidal flats inspiration for good measure. I’d been wanting to row and fish out of it since I first laid eyes on one in on a website. This past week I finally got that chance—first to chat with Towee master builder Captain Todd Gregory about how this unique watercraft came into being, then to head up to Northern Wisconsin’s musky country to play with a Rivermaster. MC: Your company is a relative newcomer to the fishing watercraft market. Tell us a little about the history of Towee Boats. TG: Well, when we started the company back in 2009, we saw that boat companies basically fell into two categories: really good boat builders who fished a little, or fishing guides who went out and learned boat building. 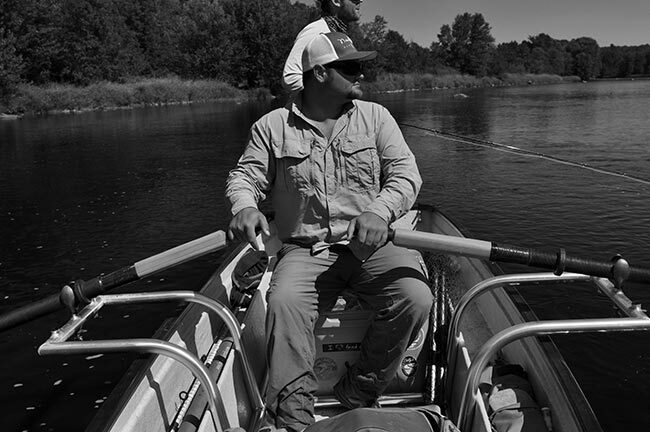 We wanted to be something different: a company founded on the partnership of guides and boat builders. Our company was really born out of necessity. Nobody in the country was designing a really durable, versatile working technical skiff, a small boat that you could do a whole lot of different things in. Something that was durable enough for floats on shallow rocky rivers but that also excelled on lakes with an outboard and/or trolling motor, something that was stable enough for three people, something that handled superbly in a variety of applications: rowing, motoring, pushpoling, heck, even paddling. We started working through designs in 2009, and our first boat came off the lot in January of 2011. MC: What kind of crew do you work with? TG: The make-up of our team is really important—it’s made up of veterans of the boat building industry. Our senior guys actually started back in 1969, and they’ve done everything from fiberglass layouts in fiberglass shops to serving as plant managers for some of the finest brands in the country, including some very high-end offshore boats. (As a side note I’ll mention that in addition to building our own boats, our shop currently produces a variety of components for high-end off-shore boats.) All in all, I would put the guys in our shop up against any other crew in the boat building world. And I know what it means to make that statement. That’s because Tennessee is a massive boat building center—bass boats, saltwater boats, you name it. If you want to build boats, this is where you come to. At Towee, we have no C or B players. We’re all A players through and through. MC: Tell us a little about what makes your skiff different. Bow cap ready for a caster with a bird’s-eye view and/or a trolling motor. TG: The word skiff is thrown around so much these days to describe a wide variety of boats. But if you look it up in a dictionary, it means “small boat”. My own background is from Tennessee, and I guided in the Keys and the Everglades to boot. So even though I grew up on smallmouth and musky, I spent a good portion of my career working out of technical saltwater boats. And those experiences got us thinking way outside the box in terms of fishing boats. I’ve actually guided musky out of bonefish skiffs up here in the shallow rocky flats of Tennessee. That all said, when the drift boat world is talking about skiffs, they are usually talking about a low-rockered, low-sided, relatively straight-chined watercraft. When I say skiff I am talking about a potentially motorized, planing hull boat that also moves wonderful under rowing or pushpoling. A quick point about driftboats: I love them and think they are a wonderful tool when they’re used for what they’re designed for–namely heavy water. But when you get away from that, when you’re not rowing Class III water, their utility diminishes very quickly. I think a lot of people who are in driftboats are there because they like to row and have never been offered another alternative technical boat of any kind. I’ll be fishing rivers like the Chippewa in Northern Wisconsin, and I’ll see guys in a driftboat, and I wonder why, since there’s no whitewater to speak of. Now we have plenty of technical whitewater here in the mountains of Tennessee, but a lot of those rivers are actually best floated in a raft, since you’re bouncing off boulders and waterfalls all day long. MC: Where are you currently selling the most boats? TG: So far our boats are doing great with the guys in the Midwest and Southeast. They’re going to fish shallow rocky rivers. They’re going to fish Northwoods lakes or Southern tailwaters. During the course of their fishing they may have to row, they may have to motor, and if they’re carping on lake Michigan they may have to push-pole. At the same time, these anglers would also like to be able to cross big open choppy water. Our boats are the answer to the angler who wants to do it all. I don’t know any other watercraft where you can get a boat into shallow rocky rivers where a driftboat can’t go, and then go and cross big choppy water. It’s unheard of, but we did it. 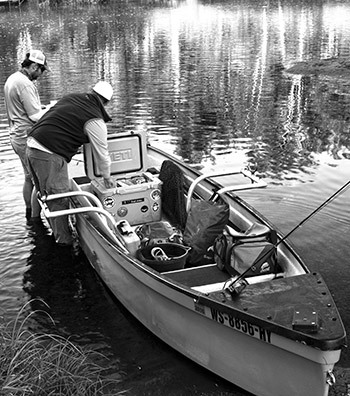 The short of it is: you don’t need three different boats for your fishing lifestyle. 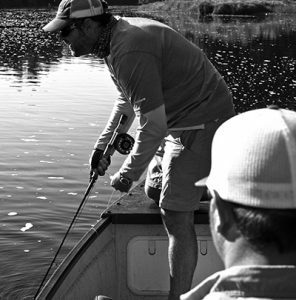 We’ve got guys who fish the Madison one month, the Chippewa the next and the Louisiana marshes the month after that. You can do all three of those things, and do them exceptionally well, in our boats. After talking to Todd, I was pretty stoked to get into a Rivermaster (length: 16’1″‘; beam: 51″; weight: 200-225 lbs dry). Wisconsin musky guide Chris Willen and I fished a stretch of Northwoods Wisconsin freestoner with many different kinds of water: mild rapids, slow pools, pocket water, and wide long expanses of rock shoals. I instantly understood why Chris loved running guide trips out of this boat: it was the only hardboat I could imagine handling this type of water. A driftboat would have drawn too much water on the rocky shoals, and would have made for several hours of dragging. A traditional fly fishing skiff, with its wide footprint, would have had to zig and zag widely to navigate the boulder fields, which often left only very narrow chutes to pass through. The Rivermaster, by contrast was able to cleave pairs of boulders with its comparatively narrow design. And this was not at the expense of stability. With three fairly large guys in the boat, we never had to worry about balance points. Bow to the King of the North. Other advantages to Rivermaster came from its simplicity and wide-open design. The boat can be customized in a variety of ways, but Chris opted for bench seats fore and aft, which meant you had actually four places to cast from: the floor of the boat in the front and rear casting buckets, from the bench seats, and finally from the bow cap–though you wouldn’t want to try that in heavy water. As we were musky fishing, I really appreciated being able to get on a knee to figure 8 at the end of each cast–it meant less stooping over from an awkward position. I also loved the vantage point from any of those three elevated casting perces—those extra few feet gave me a whole lot more perspective on the water. In keeping with the open, minimalist design, Chris had also chosen to forego casting braces. It was my first time casting out of a boat without braces, and I found that once I accepted the fact that I would be responsible for my own balance, and got used to it, I really liked it. Even the most minimalist casting braces catch line more often than we would like. That said, if we were in the heavier water more typical of large trout rivers, a casting brace would have been a welcome option. The thing I was most curious about was how a boat with a flat stern backrowed in heavier water. The Rivermaster handled our river just fine, though I should note it was not raging water by any stretch of the imagination. That said, in heavier water you can reverse the orientation of the boat by simply lifting the Yeti cooler (which acts as a rower’s seat) and placing it on the other side of the rowing frame. Voila: you’re now backrowing with your bow facing into the current. Front-rowing was a pleasure. The presence of a mild keel meant that the boat tracked very, very well–excellent for rowers who might want to sit the oars down to rig a rod or eat something. There were a few disadvantages. The open frame makes everything very accessible, but with everything out in the open, the gear you’ll inevitably carry is going to prevent this boat from being a true walk-around. Nor does the boat come with a hull-integrated anchor system. Anchors must be stored in a bucket in the boat (just like a john boat). There’s also pretty limited dry-storage options (there is a dry hatch built into the bow), so you will have to invest in a quality dry-bag for extra clothing and electronics. The take-away. This is a fantastic boat for the serious, cost-conscious, no-frills angler looking for something that serves coldwater, warmwater, and saltwater needs in a variety of locomotive applications. Smallmouth, pike, carp and musky anglers finally have a boat that runs equally well on a river and a lake. Skinny waters guys have a hard boat where previously you needed a canoe or raft. This is a watercraft very much in tune with the current direction of the sport as it moves to embrace new species, new waters, and new anglers. As a longtime smallmouth nut and aspiring musky junky, I really fell in love with this boat. If this sounds like something you’d like to learn more about, get in touch with Captain Todd at Toweemarine.com.